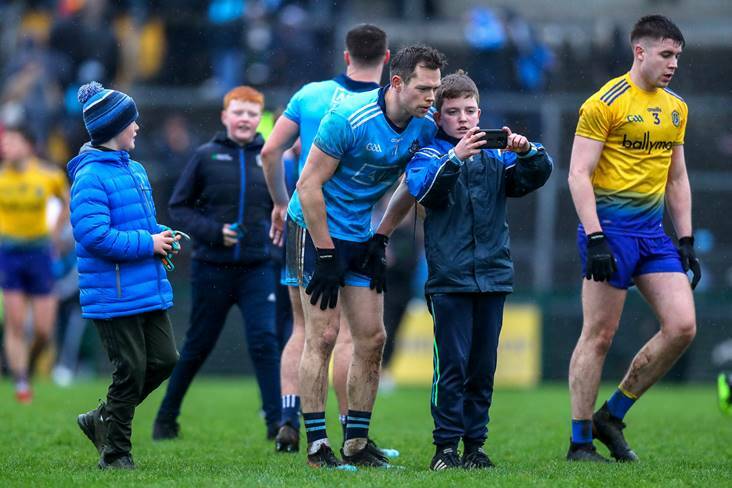 Dublin's Dean Rock poses for a selfie with a young fan after the Allianz FL Division 1 round 5 victory over Roscommon at Dr Hyde Park. ©INPHO/Tommy Dickson. A fantastic achievement - Terry Hyland has guided Leitrim to Division 3 in his first year at the helm. Leitrim captain Michael McWeeney’s dreams have come true. Relegation looms ominously over the horizon for Roscommon boss Anthony Cunningham. Tyrone is next up for Jim Gavin and the Dubs. Mickey Graham wasn’t a happy camper following the Breffni County’s defeat in Omagh. Mickey Harte admitted the dismissal of Cavan’s Killian Clarke made life that little bit easier for the Red Hands. Declan Bonner praised the roles played by experienced duo Leo McLoone and Michael Murphy as Donegal returned to winning ways against Armagh. A converted stoppage time Meath penalty denied Cian O’Neill and the Lilywhites in Pairc Tailteann. O’Neill’s opposite number Andy McEntee was delighted with the battling qualities shown by his players. Relief was the overriding emotion for Cork manager Ronan McCarthy after the Rebels secured a first win in Division 2 at Tipperary’s expense. Liam Kearns and the Premier County have a battle for survival on their hands. Laois manager John Sugrue took his hat off to veteran Ross Munnelly who reached the milestone of 100 league appearances in the county jersey against Longford on Saturday night. Carlow put a serious dent in Louth’s promotion ambitions and Turlough O’Brien was delighted with the work ethic shown by his team. Damian McErlain and the Oak Leafers’ stay in Division 4 has been short-lived.